Ebert gives this move three out of four stars. He describes the plot, the characters, the scenes, how Hollywood would have taken things one way, but, "Instead of asking us to identify with this couple, as an American film would, Wong asks us to empathize with them; that is a higher and more complex assignment, with greater rewards." The Wikipedia article's Reception section notes where it has been ranked and the awards it has won, including Best Actor at Cannes for Tony Leung and #24 in the 2012 Sight & Sound critics poll. I read something where Ebert is quoted as calling this movie "brilliant." That isn't in his review linked to above. I like to think that he would have eventually added it to his Great Movies list like he has quite a few other 3-out-of-4-star movies he has reviewed. I don't remember where I first saw this. Probably on IFC before that channel moved away from its origins. It was already in progress. I came along just before they met at the restaurant to reveal to each other their suspicions about their spouses. It was definitely an experience. I picked up the Criterion DVD and watch this now and then. Like other movies, not much happens on the surface, but there's always more to see and pick up on with each viewing. Maggie is mesmerizing and Tony's eyes are so soulful. Wong's reputation is well deserved. This is, maybe, the most beautiful movie ever. I can stare at short scenes or frames for hours. I am here for this. 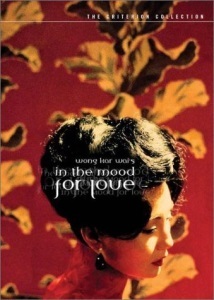 I was introduced to Wong Kar Wai by way of Chung King Express in film school, and ended up seeking out In The Mood For Love and 2046 later on the strength of that -- are you planning to post 2046 next, Fukiyama? (I want to discuss both together but I'll hold off for now if we're watching 2046 later). Alterscape, I am not. If you want to go ahead and do so, please go ahead if you want. I should watch 2046 for such a post. This is among my top 5 films ever, and a few years ago I was able to live out my dream of walking aroung Angkor Wat like Tony Leung. I did not whisper into a hole, though. I first saw it in a theater when it first ran, and it was probably among the first Criterions I bought. Everything about it is gorgeous, the pacing, the acting, the costuming, the lighting, everything. Not having a DVD player, does anyone know where you can stream this? Happy to pay but amazon looks like it's confused and only has a different version, not Wong Kar Wai's. Carillon, I am not finding it anywhere online for streaming. I see Amazon's confusion as well. Since it’s a Criterion film, I’d imagine it won’t be available until their channel is up and running in April. However, if you sign up for access now, you can see this week’s Movie of the Week(also by WKW), Chungking Express. It’s out of print, and dvd’s often go for $120 on eBay. Not having a DVD player, does anyone know where you can stream this? I streamed it for free on Kanopy, which is a streaming service that some libraries have available. JustWatch confirms that Kanopy has it (and only Kanopy right now) for the USA. What library has it though? My local one doesn't sadly. I have discovered my local library has Kanopy. Thanks for sharing that, by the way. Umm, it really depends. I would recommend looking up all libraries around you and seeing if their e-library section lists it as an available resource. The libraries around me that have access to Kanopy include a university library, a couple of city libraries, and a county library.